Antarctica is more like interstellar space than any other place on earth. It is extremely cold‚ dry‚ calm‚ and extra dark with clear seeing to great cosmic distances. 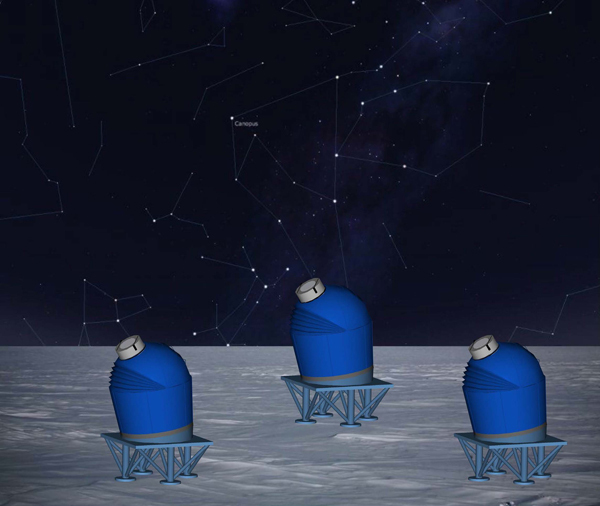 As a result‚ a telescope just a few meters tall near the South Pole can make observations as good as larger telescopes at more temperate locations and study the same objects that space satellites can study ‚ but at lower cost without sending telescopes into orbit . But installing a telescope in Antarctica is not easy. It requires the use of a giant ice-breaker ship‚ track-wheeled tractors pulling huge storage containers‚ and a crew of woolen boot- and parka-clad “expedition astronomers” . In 2005 a Chinese expedition became the first to reach the peak of the Antarctic ice cap‚ the highest point on the Antarctic Plateau 4093 meters above sea level. It was called Dome Argus‚ now known as Dome A.
PLATO webcam view of the CSTAR telescope in remote operation. In 2007 an international collaboration deployed PLATO‚ an 8-ton package of instruments installed at Dome A to measure temperature‚ wind speed and atmosphere conditions such as opacity‚ cloud cover‚ sky background light‚ atmosphere transparency and turbulence‚ as well as recording atmosphere structure in star light and moonlight and measuring Galactic emission lines . PLATO also includes robotic telescopes that can be operated remotely to make observations that yield clues about supernovae‚ exoplanets‚ dark matter‚ dark energy‚ transient objects‚ variable stars and earthquakes on stars‚ or asteroseismology. The South Pole is completely dark for about four months a year‚ offering the opportunity for continuous observation of the sky. While the view is great‚ telescopes installed in Antarctica require specialized design to withstand the cold‚ tough conditions and obtain clean images. CSTAR is one such telescope‚ and it has been operating at Dome A since 2008‚ taking an image approximately every 30 seconds during a season of four months. CSTAR consists of a cluster of 4 telescopes‚ each with a different filter‚ pointed directly at the celestial South Pole. The telescope stands approximately two meters tall and specializes in detecting variable stars and potential exoplanets. Scientists designing the optical makeup of CSTAR took precautions such as use of low-thermal materials and an electrified coating of indium-tin-oxide on the lenses to keep the surface warm. Pure nitrogen fills the tubes of the telescopes to keep the tube dry and prevent frost and ice from forming on the outside. 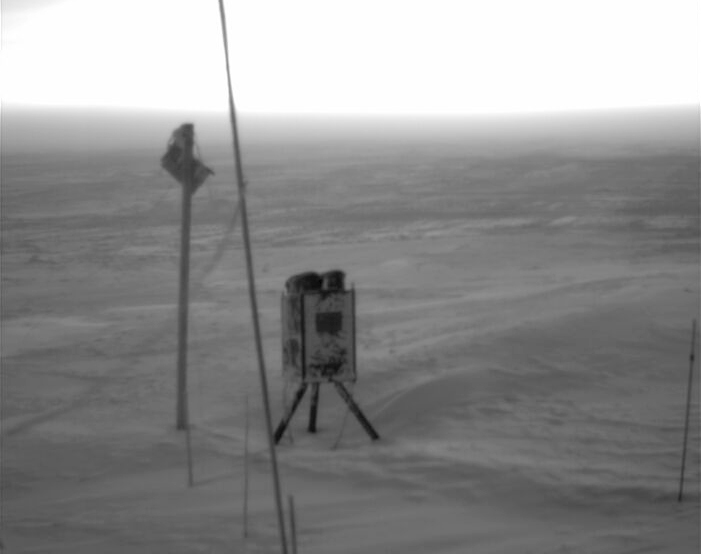 Temperatures at the installation site can dip as low as -80*C.
CSTAR was submitted to robust testing throughout 2007 and commissioned to Dome A in Jan 2008‚ observing continuously for 158 days from March to August 2008‚ with some data transferred back to scientists each day by Iridium satellite. In 2009 the 25th Chinese expedition returned to Dome A to retrieve all of the data and establish Kunlun Station‚ the third Chinese station in Antarctica. In the 2010 season CSTAR recorded data for 183 days. Render of AST3 installed on platforms attached to the Antarctic ice. In 2012 a larger‚ more advanced‚ Antarctic Schmidt Telescope (AST3) was deployed at Dome A by the 28th Chinese Antarctic Inland Scientific Research Expedition. Whereas the CSTAR telescope is stationary‚ AST3 can scan the entire viewable sky‚ moving at intervals to capture images of the sky and taking an image approximately every one to three minutes. In its first season in operation‚ AST3-1 collected more than 3 terabytes of data‚ with an estimated 10 terabytes per year . AST3 is equipped with the largest single CCD chip in use [6, 7]‚ a square that is 10‚000 by 10‚000 pixels. The CCD was tested for parameters such as pixel uniformity‚ dynamic range‚ quantum efficiency‚ gain (a conversion related to the number of electrons in each pixel)‚ dark current (caused by the CCD getting too warm)‚ and charge transfer efficiency (charges bleeding onto adjacent pixels). The telescopes each use a different filter so that “multi-color observations” can be made without the need for “mechanical moving parts”  The design was adjusted to be able to do initial photometric data processing in real-time and send back some of the information for preliminary scientific analysis . A total of three AST3 telescopes are installed at Dome A‚ and with each deployment better tools are integrated into the Antarctic site. The data they obtain from the robotic telescopes in Antarctica is allowing scientists to better understand the nature of dark matter in the universe‚ to sharpen the focus on the search for exoplanets‚ characterize variable stars‚ and add to the knowledge base of centuries of cataloging the sky‚ but with the added fervor of huge amounts of data and sophisticated methods for sorting out the millions of stars that appear in a single image. Scientists are able to capture more data and images of the night sky from these small‚ frozen ground-based telescopes more accurately and in larger data-sets each year. Data from one observing season can include over 800‚000 images each containing up to 400‚000 stars. INSTRUMENT: One Antarctic Night is a collaborative art + science team that is using over 1 million data files including images and associated metadata files provided by astrophysicists working on CSTAR & AST3. The INSTRUMENT team is creating an immersive system that allows interaction with the data through sound‚ visuals and movement: a data experience for the gallery and the laboratory. Traverse from the Antarctic coast to Dome A.
xREZ Art+Science lab forges productive paths that harness the unique creative forces found only at the intersection of the arts, sciences, and humanities to open new portals of imagination, knowledge and communication. Our goal: alter the landscape of human endeavor to create a transformative impact on our world and our future.